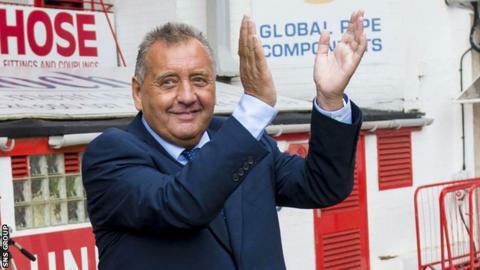 Jimmy Calderwood blames then director of football development Willie Miller for his exit as Aberdeen manager. Calderwood left after his side finished fourth to qualify for the Europa League and was succeeded in 2009 by Miller's former Aberdeen team-mate, Mark McGhee. However, Miller insists he "gave Calderwood five wonderful years at the club and supported him to the hilt". Calderwood told BBC Scotland: "I honestly believe it was Willie because Willie was strange in the end." The 60-year-old, who also managed Dunfermline, Kilmarnock and Ross County, has been out of work since leaving De Graafschap in 2014. He says being out of football is "killing me" and cannot understand why he has not had a job since his last sojourn in the Netherlands. His departure from Pittodrie remains one of his most painful memories, the Scot having paid for being edged into fourth spot in the top-flight behind Rangers, Celtic and Hearts. "I had to go to the chairman's house and I thought we were talking about next season," Calderwood said of his end-of-season meeting with Stewart Milne and Miller. "I was told they were thinking of making changes but it's not certain yet. "That's when I made a mug of it. I said 'it's certain now. If you are doubting what we're doing at this club, it is certain if that's what you want to do'. "I said to Willie, what are you thinking about this? But Willie said nothing. I thought 'this is a done deal, they are at it'." Calderwood believes that a majority of Aberdeen fans were similarly mystified over a departure the club said was by "mutual consent" but which he insists was a sacking. Miller is surprised that his former manager has only had brief stints at Killie and County in Scotland since then, helping to steer both clubs away from the threat of relegation. But he did say a dip in form had been to blame for Calderwood's departure. "There was a feeling among the board that the quality of football wasn't what they were expecting in that final year," he told BBC Scotland. "His league record was solid, absolutely. There was a fantastic run in the Europa Cup too. But no cup finals in that time. "And from the turn of the year in that last season, there were only five wins from 19 games. "I don't think the fans were particularly happy with what they were seeing at that time." Under Calderwood, Aberdeen finished third once, fourth twice and sixth once, but he found himself replaced with McGhee, who had enjoyed success with Motherwell. "I think Willie and Mark were quite close," said Calderwood, who says he has not spoken to Milne or Miller since. "If I was in England watching games, Willie was down there a lot with Mark and big Alex McLeish. But Miller denies that, saying: "I'm not particularly close with Mark. "When Jimmy left we needed to find a new manager and Mark was one who was doing extremely well. There was certainly no conspiracy to bring Mark back to Aberdeen on my part." Miller and Calderwood had grown up together, playing in opposing sides and together for Scotland in their youth days. "He is a legend," added Calderwood. "He was absolutely brilliant for me in the first season, but I think he thought I was getting too big and powerful for him and there wasn't much dialogue in the end." Miller said he was "baffled" by that comment, adding that he did "everything I possibly could to make his job a success".